TORONTO, April 03, 2019 (GLOBE NEWSWIRE) — MediPharm Labs Corp. (TSXV: LABS) (OTCQB: MLCPF) (FSE: MLZ) (“MediPharm Labs” or the “Company”) a global leader in specialized, research-driven cannabis extraction, distillation, purification and cannabinoid isolation, is pleased to announce fourth quarter and full year financial results for the year ended December 31, 2018. The audited consolidated financial statements and management’s discussion and analysis for the periods are available on SEDAR. Signed 4 multi-year tolling agreements with James E. Wagner Cultivation Corporation, INDIVA Limited, Emerald Health Therapeutics, Inc. and The Supreme Cannabis Company, Inc.
As leading extraction specialists, we demonstrated our ability to rapidly expand our footprint and achieve significant revenue and positive operating cash flow just weeks after receiving our sales License, and our strong operations have continued into 2019. The strength of this performance validates our uniquely focused strategy and investments. We are proud that the MediPharm Labs team stands out among the top global players in the cannabis industry producing tangible results with significant future potential. Forge additional domestic and International sales and supply agreements – Utilizing a first-mover and other proprietary advantages, the Company is focused on procuring cost efficient, bulk dried cannabis supply, increasing wholesale Private Label cannabis concentrate (crude resin and distillate) production and value-added products, services and tolling to win new business domestically and internationally. Expand White-Label Solutions Platform Including Formulation, Processing and Distribution Services – Expected legalization of vapeables, edibles, beverages and topicals in October 2019 is also expected to expand the Company’s addressable market and act as a catalyst to encourage a broad array of direct-to-consumer brands and non-cannabis consumer packaged goods companies to seek partners like MediPharm Labs for formulation, processing and provincial distribution. Increase cGMP Production Capacity – The Company is on track with the installation and commissioning of 2 additional primary extraction lines at its Barrie facility that are expected to increase annual processing capacity to 250,000 kg over a total of 7 extraction lines. Utilizing cGMP methodology, multiple extraction lines provide flexibility to dedicate to specific customer batches and significantly enhance productivity. Flexibility over multiple extraction lines will be transformative, providing a continued competitive advantage in the cannabis market. Achieve European Union GMP Certification at Barrie Facility – Expect to achieve certification in the H2 2019 enabling the Company to serve substantial European demand. Complete First International Facility in Australia – Australian centre of excellence is expected to be commissioned in H2 2019, pending licensing, and will act as hub to access Asia-Pacific regions. The facility is designed to produce to cGMP standards with annual extraction capacity of approximately 75,000 kg of dried cannabis. The Australia region provides a strong backdrop for cultivation given more favorable farming conditions where the Company expects to procure locally sourced lower-cost supply inputs for production. Expand Secondary Extraction Capabilities – Advancing industrial-scale distillation and commercial chromatography capabilities to produce active pharmaceutical ingredients that require cannabinoid purity of at least 99.9%. Development is underway for specialized, proprietary chromatography processing with trials to commence H2 2019. M&A and Joint Venture Opportunities – The Company has established a robust pipeline of opportunities to replicate its unique business model in other jurisdictions and complementary acquisitions to further enhance and accelerate organic growth. All dollar amounts are expressed in Canadian dollars unless otherwise stated. ¹Adjusted EBITDA is not a recognized performance measure under IFRS, does not have a standardized meaning and therefore may not be comparable to similar measures presented by other issuers. Adjusted EBITDA is included as a supplemental disclosure because Management believes that such measurement provides a better assessment of the Company’s operations on a continuing basis by eliminating certain non-cash charges and charges or gains that are nonrecurring. Adjusted EBITDA is defined as net loss excluding interest, taxes, depreciation and amortization, and share-based compensation and listing expense. Adjusted EBITDA has limitations as an analytical tool as it does not include depreciation and amortization expense, interest income and expense, taxes, share-based compensation and transaction fees. Because of these limitations, Adjusted EBITDA should not be considered as the sole measure of the Company’s performance and should not be considered in isolation from, or as a substitute for, analysis of the Company’s results as reported under IFRS. 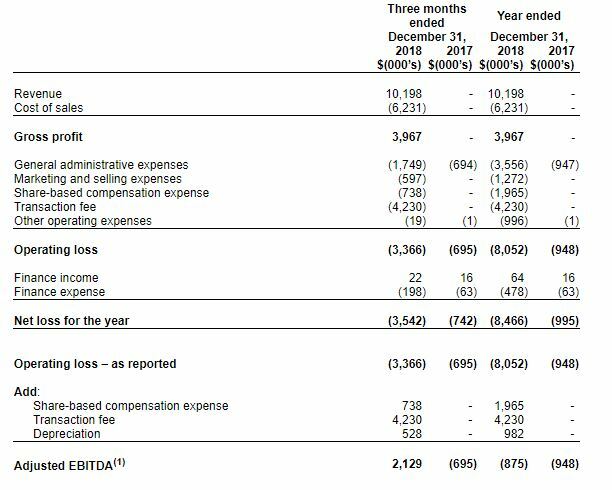 The most directly comparable measure to Adjusted EBITDA calculated in accordance with IFRS is operating income (loss). The above is a reconciliation of the Company’s operating loss to Adjusted EBITDA. See “Reconciliation of non-IFRS measures” in the Company’s Management’s Discussion and Analysis for the year ended December 31, 2018 additional information. Founded in 2015, MediPharm Labs has the distinction of being the first company in Canada to become a licensed producer for cannabis oil production under the ACMPR without first receiving a cannabis cultivation license. This expert focus on cannabis concentrates from our cGMP (current Good Manufacturing Practices) and ISO standard clean rooms and critical environments laboratory, allows MediPharm Labs to produce purified, pharmaceutical-like cannabis oil and concentrates for advanced derivative products. MediPharm Labs has invested in an expert, research-driven team, state-of-the-art technology, downstream extraction methodologies and purpose-built facilities to deliver pure, safe and precisely-dosed cannabis products to patients and consumers. MediPharm Labs’ private label program is a high margin business for the Company, whereby it opportunistically procures dry cannabis flower and trim from its numerous product supply partners, to produce proprietary cannabis oil concentrate products for resale globally on a private label basis.